Flights by NASA's SOFIA airborne observatory are on hold during the government shutdown. "We know we've lost flight opportunities in Cycle 6, and I apologize to the [principal investigators] who are going to suffer because of this," said Harold Yorke, director of SOFIA science mission operations at the Universities Space Research Association, at the meeting, referring to the ongoing program of observations that SOFIA was carrying out. The situation with SOFIA stands in contrast with NASA spacecraft missions, which are able to continue operations. The agency's shutdown plan states that "tracking, operation, and support" of satellites is excepted from the shutdown "for safety and protection of life and property." That doesn't apply to an airborne program like SOFIA, which can meet the safety and protection requirements by simply remaining on the ground. 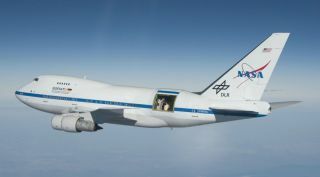 Once the shutdown ends, Yorke said it will take about a week to resume SOFIA science flights because of the time needed to prepare both the aircraft and the telescope's instruments. "We will be rethinking the rest of Cycle 6 to see how we can replan and perhaps recover some of this lost time," he said. "That played havoc with Cycle 6. We lost a number of flight opportunities," Yorke said. An adjusted schedule of flights helped the program rebound from that delay. "We were able to recover basically all of the lost targets." The first of those reviews, called the SOFIA Operations and Maintenance Efficiency Review (SOMER), is nearing completion. "They're looking at alternate models for operating SOFIA and maintaining SOFIA," Yorke said, that would reduce costs or increase its flight rate. That report is scheduled for completion in February. That will be followed by the Flagship Mission Review (FMR), which will focus on SOFIA science. That review will be completed under what he termed a "compressed schedule" for delivery to NASA in the spring. "NASA needs the results to formulate its future plan for SOFIA based on both the SOMER and FMR reports," he said, which he anticipated to come in May.